Keawaiki is a starkly beautiful South Kohala bay with a lone palm tree on its rocky shore. While this certainly isn't the best swimming beach on the Kohala coast, this area is rich with natural beauty and ancient history. This hike ends at a unique spot called the Golden Pools of Keawaiki. These are anchialine pools, which are landlocked bodies of freshwater with an underground connection with the ocean. There are many of these brackish pools throughout the island of Hawai'i, but these pools contain a unique golden algae. Near the Golden Pools of Keawaiki are the ruins of an ancient heiau (temple) and several other structures. 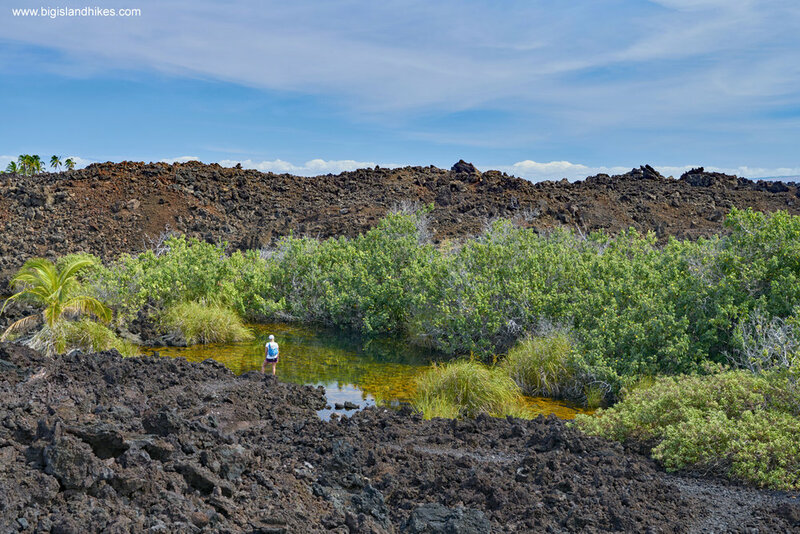 These sites were destroyed by an 1859 eruption of Mauna Loa. This eruption accounts for all the harsh 'aʻā lava in the area. Big Island Hikes has longer loop hike in this area. See Keawaiki Bay to ʻAnaehoʻomalu Bay. Trailhead: This unmarked pull-out on Hwy. 19 is located about ¾ of a mile between Mile Markers 78 and 79, closer to 79. Do not attempt to drive the road or block the gate near the trailhead – this is private property. Be careful pulling back out into traffic on the busy highway. This trailhead has no services. Gear: Standard hiking gear. Bring plenty of water and sunscreen. This hike follows very rough lava trails that will shred standard running shoes, so wear your boots for this one. Hike: From the trailhead, locate a rough four-wheel drive road heading makai (toward the sea). This is a public access, but it skirts private property. After about a tenth of a mile, you'll cross the ramrod-straight King’s Highway trail. The King’s Highway was an ancient trail built by hand that traverses this entire part of the island. Walk the road through rough ʻaʻā lava for a little over a half mile, always staying to the north of the posted Private Property. Halfway to the beach, a smaller trail will divert from the 4WD road. This is the public access. Arrive at Keawaiki Bay and its lone palm tree. Follow the contour of the bay past the palm tree and across a short promontory and arrive at Pueo Bay, which has nice swimming in clear waters. From the center of Pueo Bay, locate a faint trail near the back of the beach near a big boulder. This trail leads toward the patches of green you can see offshore. These oases are brackish anchialine pools. The first pools you’ll come to are the Golden Pools of Keawaiki. The gold is a unique algae growing on the ʻaʻā lava pools. Please don’t touch or swim in these pools to preserve this unique ecosystem. If you continue back toward the highway along the trail, you'll find another anchialine pool among some ancient Hawaiian structures. Keep out of the pools and don't touch any ancient sites. After you’re done visiting these unique ecosystems among the ʻaʻā destruction, hike back toward Pueo Bay. Return to the trailhead the way you came.